Hide My IP - Is Elite Proxy Switcher The Best Method? Hide your IP address by 6 popular methods and find the best one. 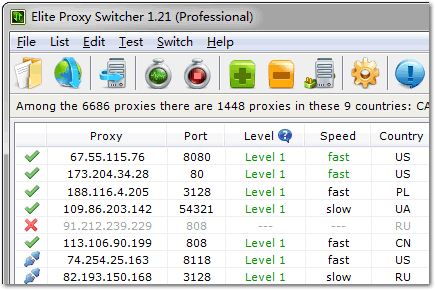 We recommend Elite Proxy Switcher if you need thousands of IP addresses. It uses public http proxy so it has thousands of IP addresses. But http proxy has 3 drawbacks. Public proxies are unstable. You have to update your proxy list frequently. Not every http proxy supports the https websites such as facebook and craigslist. Not every http proxy is anonymous. There are three types of http proxy according the anonymity. Level 1: The web server can't detect whether you are using a proxy by the information your browser sent. Level 2: The web server knows that you are probably using a proxy, but it can't detect your real IP. Level 3: The web server knows that you are using a proxy and it can also detect your real IP address. If you don't want to use the proxy software to download the proxy list or you aren't using Windows, you can buy the proxy list from us-proxy.org. The proxy list is same as the one of Elite Proxy Switcher. Advantage: It has thousands of IP addresses which are updated every hour. Shortcoming: Public proxies are unstable, need being updated frequently. Audience: Best for the users who need many IP addresses but only use them for a while. * Not every http proxy supports the https websites such as facebook and craigslist. If you bought the proxy list service, please just click the menu File->Download List. You can also get some proxies from Free Proxy List or My-Proxy List. Open the proxy list page, select the proxies and click ctrl+c to copy them into memory. 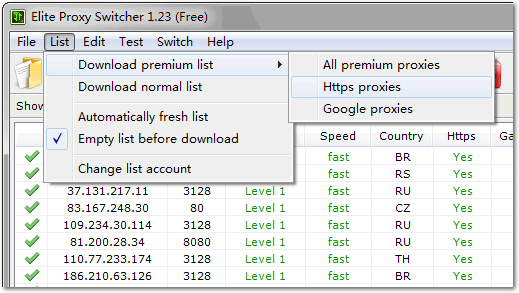 Open Elite Proxy Switcher, click ctrl+v to paste the proxies into it. Click the Elite Proxy Switcher menu Test->All to test all the proxies. Double click the proxy you want to use as the active proxy for your IE and Firefox. You are now surfing through the proxy. You can check your IP to see whether the proxy works. Here is a 3-minute video tutorial for you. Notice that Elite Proxy Switcher Professional does not include the proxy list service. If you need proxy list rather than the software, please buy proxy list instead. Both the Free and the Pro edition can download the proxy list.